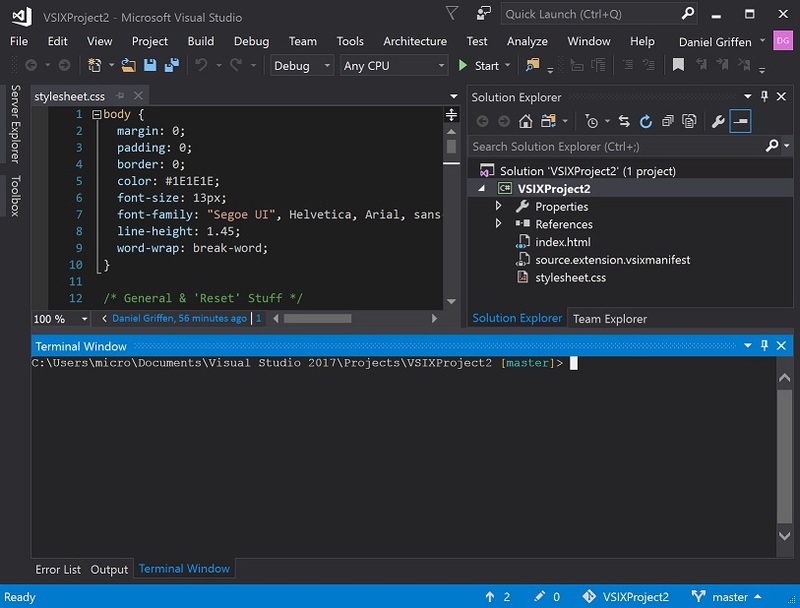 Microsoft's Scott Hanselman is trying to drum up interest in a community project created to provide an integrated terminal for command-line operations in the Visual Studio IDE. Such a terminal was a much-requested feature for the Visual Studio Code editor -- getting more than 6,000 votes on the old UserVoice site -- and is still being improved after being introduced in May of last year. Now, for the full-fledged Visual Studio IDE, the Whack Whack Terminal is offered on the Visual Studio Marketplace, authored by Daniel Griffen. It was yesterday touted in a personal blog post titled "A Proper Terminal for Visual Studio" by Hanselman, principal community architect for Web Platform and Tools. 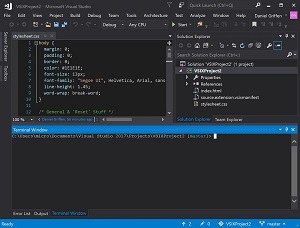 Hanselman said, "Whack Whack Terminal is an experimental free plugin for Visual Studio 2017 that aims to bring a full terminal inside of Visual Studio. Those of you who use Visual Studio Code have long enjoyed the integrated xtermjs terminal. Justin Clareburt worked with Daniel Griffen on hacking together this solution as an experiment." [Click on image for larger view.] The Whack Whack Terminal (source: Visual Studio Marketplace). Its entry in the Visual Studio Marketplace -- where the project was last updated July 29 -- says, "Whack Whack Terminal is a terminal emulator for Visual Studio 2017. Unlike other terminals for VS, Whack Whack Terminal is fully interactive. Users can launch interactive git commits, vim, or almost any other command line utility." 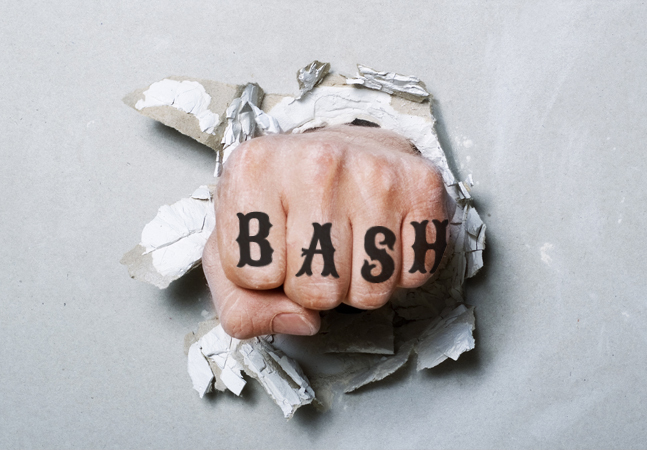 Furthermore, it lets developers run command prompt, PowerShell and Windows Subsystem for Linux (WSL) bash, all available in interactive mode. Whack Whack Terminal's name comes from the keyboard sequence required to open it up, a double "Ctrl+\" combination (Hanselman explained "whack" is shorthand for the slash character, either forward or backward). In comments on Hanselman's blog post, Griffen today said the project was developed during a company hackathon, so the nearly empty GitHub project doesn't have the source code yet, awaiting a legal approval process from the company before it can go open source. Some commenters noted they use the existing ConEmu "Handy Windows Terminal" that's available via NuGet, and one asked why it couldn't be integrated. Griffen explained that ConEmu requires installation on developer systems, while Whack Whack Terminal doesn't require any external installation. "The other issue with simply embedding ConEmu is that my ability to integrate it and make it feel more like an actual part of visual studio is limited," Griffen explained. "With the technology stack I'm using I have almost full control of the terminal windows behavior and styling." The project so far has garnered 588 installs and only three user reviews, all five stars. While listed as experimental only, Hanselman is hoping it goes further than that. "There is no plans for it to be more than an experiment, I'm told BUT I always say vote with your feet," Hanselman said. "I figure a few tens of thousands of installs and someone will decide to build it in. I have long used Mads Kristensen's Quake Mode that lets me launch a command prompt from VS, but ever since the NuGet Package manager showed up in VS many years ago, I've always wanted a real FULL terminal in VS."
Hanselman described the code as alpha quality right now at version 0.2, with Griffen aiming for full feature parity with the VS Code terminal in version 1.0. On the Visual Studio UserVoice site, there are many requests for an integrated terminal, but none with anything near the 6,000-plus votes the VS Code terminal got. Nevertheless, Hanselman for one is hoping it takes off. "Go install Whack Whack in VS2017 NOW! Nothing ventured, nothing gained!" he said.